Where Iowa Dog Bites Happen and Who Pays | Hupy and Abraham, S.C.
Before we discuss where some dog bites accidents happen, it is important to be aware that a dog bite can occur anywhere and at any time. Even a seemingly docile dog that you’ve known for years can bite, and if that dog is not your own pet then you may have the right to recover damages for your injuries if you act quickly. At vet’s offices and other businesses. Dogs don’t always stay home. 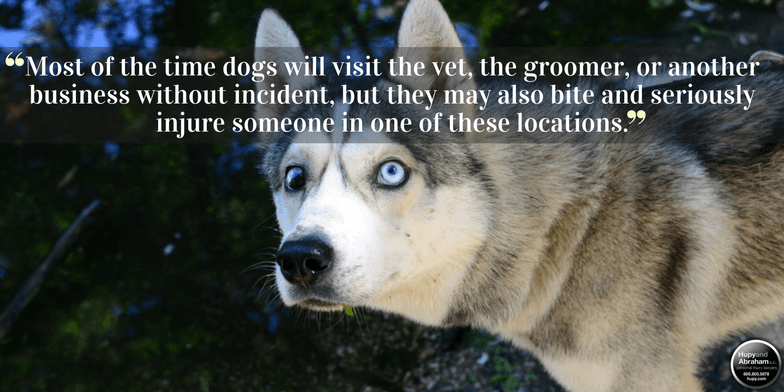 Most of the time they visit the vet, the groomer, or another business without incident, but they can bite and seriously injure someone in one of these locations. At the park or playground. It can be fun to take a dog to the park, but it can also be dangerous. Dogs may be unpredictable and may hurt children or adults who are also at the recreational facility. On sidewalks or in your own yard. A dog may be on a walk with its owner or escaped from its yard while you are walking on the sidewalk or standing on your own property. In these cases, you need to know what to do to protect your potential recovery. At other people’s homes. You may be a guest or worker in someone else’s home when their dog bites, attacks, or otherwise hurts you. Even though you voluntarily entered the home with the dog present, you may still be able to recover damages for your injuries. If you’ve been hurt in any of these places—or anywhere else in Iowa—then you need an answer to a very important question. Who Is Going to Pay for Your Medical Expenses and Other Damages? In most cases, it is the dog’s owner who is legally responsible for paying for your dog bite or dog attack injuries. Iowa law makes dog owners responsible for all damages when a person is hurt by his or her dog. However, it is up to you to take action to make sure that the dog owner pays and that you get the fair recovery that you deserve. You can begin taking action today by calling an experienced dog bite lawyer who will fight for you. Call us anytime—24/7—at 1-800-800-5678 to learn more.